My guest today is Rebecca Rosenberg. 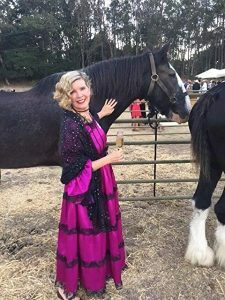 A California native, Rebecca lives on a lavender farm with her family in Sonoma, the Valley of the Moon, where author, Jack London, wrote from his Beauty Ranch. Rebecca is a long-time student of Jack London’s works and an avid fan of his daring wife, Charmian London. The Secret Life of Mrs. London is her debut novel, following her non-fiction, Lavender Fields of America. Her upcoming novel, Gold Digger, will be released in March, 2019. Rebecca and her husband, Gary, own Sonoma Lavender the largest lavender product company in America, selling to 4000 resorts, spas and gift stores. The Rosenbergs believe in giving back to the Sonoma Community, supporting many causes through financial donations and board positions, including Jack London Park, and Happy Walls, Charmian London’s residence and museum, as well as Worth Our Weight, an educational culinary program for at-risk children, YWCA shelter for abused women, Luther Burbank Performing Arts Center to provide performances for children, Sonoma Food Bank, Sonoma Boys and Girls Club, and the Valley of the Moon Children’s Home. You can connect with Rebecca via her website and Facebook. The Secret Life of Mrs. London can be found an Amazon US, Amazon UK and Amazon Australia. I love good stories rather than fancy writing. At sixteen I read Gone With The Wind, Doctor Zhivago, War and Peace and I was hooked on epic stories that teach us about people who lived in an era gone by. The Secret Life of Mrs. London was inspired by the adventurous, bohemian, limit-busting the London’s Beauty Ranch, which is now Jack London Park. I rode horses and hiked all over the London’s land for twenty years, discovering Pig Palace where Jack London kept his pigs in luxury, the pond where Charmian London swam, the cottage where Jack dictated his books to Charmian as she typed them up, later editing. And, the great Wolf House, a 25,000 sq. foot log lodge that mysteriously burned down before the London’s moved in. I could not help researching the Londons and reading both of their books. You can actually get a free ebook of all 50 of Jack London’s works! I wanted to write about the adventurous, bohemian London’s, but when I found out Charmian had an affair with Houdini, I knew that would be an even more satisfying novel! I am more interested in a woman’s story, rather than a specific time period. 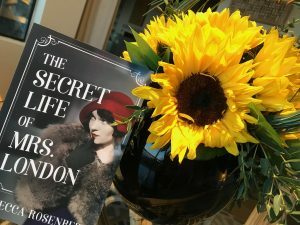 The Secret Life of Mrs. London is 1915-1918, America, just before World War I, a challenging time. 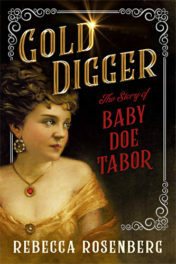 Gold Digger, the story of remarkable Baby Doe Tabor, is set in 1878 when a twenty year old girl comes west with her new husband to work a gold mine and finds herself abandoned and pregnant, yet still works the mine. The novel series I am writing now is Champagne Widows, about the five French widows 1800-1945 who made champagne the worldwide phenomenon it is today. For me, it’s about remarkable women’s stories, regardless of time period. I travel to the place and spend time soaking in everything it has to offer. In the case of The Secret Life of Mrs. London, I wrote many afternoons sitting at a picnic table at Jack London’s Beauty Ranch. There you hear the bird sounds, smell the specific scents, feel the weather, imagine how they lived. I also read many Jack London books, and Charmian London’s books, including her biography, “Jack London.” I read many biographies of Houdini and Jack London, and Charmian’s diaries and letters. How long did it take to finish the novel? 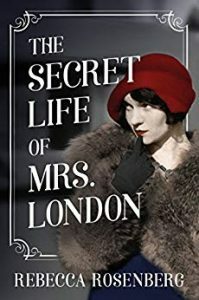 It took 3 years to complete The Secret Life of Mrs. London, and a year before that in research. I love the thesaurus and the computer version has made it easier! Sometimes you have to search many words to find the right meaning. Before writing a book, I research the language needed. In The Secret Life of Mrs. London, I have a Japanese servant, Hawaiian characters and a Romany woman. I used some words in all those languages. I only write on one manuscript, which I see as a block of granite which I am sculpting. Many writers write many different versions, but I only work on one manuscript. If I cut a scene, I do save it, but usually do not return to it. I think of the novel as a story to be reread and rewritten until it flows as the story I want to tell. This may take a hundred rewrites! No, I have tried it and feel it doesn’t suit my process. Maybe I’ll try in the future! Do you ever write in long hand? I have but it does not work well for me, because what I scribble in long hand needs to be typed and I rewrite several times in the process. 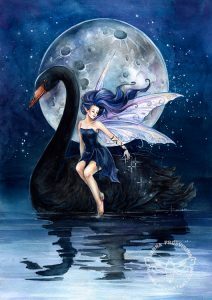 There is a legend about a Black Swan who seduces a woman, painted by many artists all over the world. I love that image to understand Houdini seducing Charmian. Houdini is mysterious and other-worldly and she can’t resist his spell, even though she is an independent woman. He is magic. My advice is to take as many workshops and writing intensives as you can. Join a critique group. Write everyday. Read everyday. Sound familiar? But more specifically, make sure your novel concept is compelling. Why will readers want to read your book? Write the back cover blurb first and keep rewriting it grabs a reader to pick up that novel! Thanks for dropping by, Rebecca. How lovely to live amid lavender! Good luck with Gold Digger. Both “The Secret Life of Mrs. London” and “Gold Digger” sound fascinating and I love hearing about Rebecca’s process of writing. I look forward to exploring her books! How lovely it must be to live on a lavender farm! Congrats on your new book – Can’t wait to read it! I admire their great philanthropical contributions…that is inspiring! I love to read! I require paperbacks, but I’m very poor, so I can’t get new ones very often. I can’t read online, since it gives me a ugly headache and I can’t use audio books since I’m almost deaf. Both of these upcoming novels sound fabulous! I can’t wait to read them. The Secret Life of Mrs. London is on my kindle, waiting to be read. :-) Thanks for the interview! This has to be one of the best interviews with an author that I’ve read in awhile. Great questions! I loved the Mrs. London book. Eager to read Gold Digger! Gold Digger sounds like an interesting read. I love the books by Jack London and tales of life in the wild. Can’t wait to read it! I’m so glad I read this interview. It wasn’t just for a free book. As an author and a person, Rebecca Rosenberg sounds remarkable. I’m truly looking forward to reading Gold Digger. The Secret Life of Mrs. London is not only on my reading list but on my TO BUY list! I’m so glad to hear about these books by Rebecca Rosenberg .They are right up my alley. I love books that are based on real people’s lives. I’m looking forward to reading them both. I enjoyed learning about Rebecca and her books! What great authors to be inspired by! I have read and re-read Doctor Zhivago many times. Thank you for the chance to receive a copy of Gold Digger. I have added Gold Digger and The Secret Life of Mrs. London to my to be read list. Jack London is another favourite of mine and Harry Houdini, well I was devastated when a local museum, devoted to him, burned to the ground a few years ago. I would love to ready Gold Digger and The Secret Life of Mrs. London. Will add them to my reading list as well. I can’t read online..it gives me a nasty headache, so I read paperbacks. She sounds like a very amazing person. How intriguing. What amazing people and I am eager to read these books. The combo of a pregnant 20 year old that’s involved in gold mining intrigue s me. In those days am sure those daring ladies existed at that time. And Jack London …… read a few of his over the years but never knew much about his life and loves other than writing. New author to me. Both books sound fascinating. These are the kinds of stories I love, and I definitely have two more books to check out now! I love finding new books to read. This sounds interesting. I would like to read an ARC.